The hue of Allah -and whose hue is better than Allah's? (Al-Baqarah 2:138). The Islamic concept has Special characteristics that distinguish it from all other concepts, giving it an independent personality and a particular temperament. This concept cannot be intermixed with any other nor can anything be added to it from other concepts. The characteristics are numerous and varied, but all of them can be gathered together under one primary characteristic, of which all other characteristics are branches and from which they proceed, namely, the characteristic of being originated by Allah. This concept is divinely ordained by Allah with all its constituents and characteristics not so that man may add something to it or take something away from it, but so that man may receive it whole-heartedly, adapt himself to it, and apply its corollaries to his life. Since this concept comes directly from Allah, it is inherently un­changeable and causes mankind to evolve within its framework and to progress by understanding and applying its message. Mankind can Continue to evolve, progress, grow, and advance indefinitely within the framework of this concept, because the spaciousness of this framework is very wide and the ability of this concept to set ever higher goals is unlimited. This is so because the source of this concept is the very source Who created man. He is the All-Wise Creator Who knows the nature of the human being and his changing needs through time. And to meet these needs He has endowed this concept with characteristics evolving within the vast boundaries of its framework. The concepts, religions, and systems that men have devised for themselves Outside Allah's guidance must always change, because man feels constrained by them as his demands increase and his needs evolve. Accordingly man feels the need to update principles, trans­form rules, and, occasionally, completely overturn them. This need for constant updating results because these concepts, religions, and systems are formulated by men in response to the conditions, cir­cumstances, and needs of a particular group of people living in a particular region of the world at a particular point in time. This parochialism is compounded by man's ignorance, shortcomings, prejudices, and selfish desires. Subsequent generations find the con­cepts, religions, and systems devised by earlier generations defective, erroneous, and irrelevant. Hence the need for continued updating and change. In contrast to this, the Islamic concept originating in Allah, is different in its origin and in its characteristics from all these humanly­ devised perspectives. By its very nature it does not require any updating or change, for the One Who made it sees without any limitations of time and space, knows without any defect of ignorance or error, and decides without any influence of prejudice or selfish desire. He made this concept for the totality of mankind for all times and conditions as a holistic paradigm or permanent system of prin­ciples within the bounds of which mankind develops, evolves, grows, and advances without ever reaching the boundaries of its framework. Motion, it appears, is a law of the universe and it also is a law in the life of man who is a part of the universe. But this law of motion is not free of restrictions or without some control, if only because it is a coherent system. An analogy to the life of a man is a planet with an orbit and an axis. This Divinely-revealed Islamic concept is like the sun around which the life of all mankind is to revolve. There is plenty of room for mankind to grow, progress, advance, and evolve, while still remaining in the field of attraction of this central concept. Moreover, this concept is perfect and complete. It does not require any "spare parts" from outside or any change for completion. Since it is given by Allah, nothing from a source other than Him can fit it. Man is incapable of adding anything to it or making any corrections in it. Indeed, it has come as a gift to man in order to make him grow, correct him, and propel him forward. It has come to enrich his heart, his intellect, his life, and his world. This concept is designed to awaken all his powers and potentialities and to employ them entirely for constructive purposes under its own direction and control, so that they are not dissipated in futile pursuits. For the fulfillment of these objectives this Divinely-revealed concept does not need to borrow from outside nor does it need the infusion of foreign blood nor any methodology other than its own. Indeed, this concept demands to be the only controlling element in the life of man, because it has self-contained goals, incentives, methodology, resources, and all the necessary instruments to help translate its goals into a way of living that is harmonious with the universe in which man lives, so that his motion may not collide with the motion of the universe and be shattered and annihilated. And this concept is comprehensive and balanced, taking into con­sideration all aspects of man's being and providing a balance and harmony among these aspects. Similarly, it takes into consideration all aspects of humankind, because it comes from the One Who made man and knows whom He created, namely, from the One Who is Subtle and All-Knowing. The remote vistas and varied situations through which the life of the human race will pass are not hidden from His sight. He Himself made this concept for the human race, as a governing paradigm that is all-inclusive, providing a balance for all of mankind's constituent elements and for all aspects of every person's life. At the same time, this concept is practical and in harmony with man's social nature. This concept necessarily is the only true standard to which man can refer in any place or at any time for judging his concepts and values, methods and systems, morals and manners, and customs and laws, in order to know whether he is right and whether he is truly close to Allah. And if you have a dispute concerning any matter, refer it to Allah and the Messenger if you are sincere believers in Allah and the Last Day. This is better and fairer in the end (Al-Nisa' 4:59). 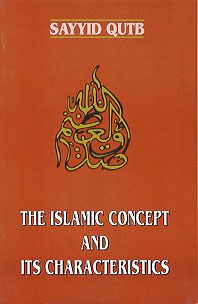 In this basic characteristic, namely, that it has come from Allah, and in all the other characteristics that proceed from it, we see clearly that the Islamic concept is unique among all paradigms of thought and life that it has its own personality and distinguishing features, and that it would be a grave methodological error to treat it like any other man-made concept by applying to it criteria borrowed from other sources or molding it to fit with man-made ways of thought prevailing on earth. Similarly, it would be a serious error to join other concepts with it or to subtract anything from it, for it is a divinely- originated and comprehensive concept perfect in itself. We shall see all this more clearly as we proceed further. For the present, it is sufficient to state the following principle: in every research on Islam, whether in Islamic thought or Islamic methodol­ogy, this characteristic of Islam's Divine origin must be fully taken into consideration, for this is where the ways separate. We shall now take a detailed look at this basic characteristic of the Islamic concept and at all other characteristics that proceed from it.